(CLASSIC COUNTRY) NTSC, Code 0, Color, 134 Mins. Fifty years ago this year, Porter Wagoner left Springfield, Missouri bound for Nashville. He'd been offered membership of the Grand Ole Opry, although the offer had come at a troubled moment in the show's long history. The twin threats of rock 'n' roll and television had left the Opry House half-empty some nights. Many of Porter's contemporaries were flirting with rockabilly, trying somehow to stay afloat. The Opry had to decide if it would go pop or stand firm with the music that had made the show and country music almost synonymous. The Opry decided to leave rock 'n' roll to others, and hired several new singers who would reinforce its tradition-based roster. That's why Porter Wagoner was heading for Nashville. He was… and would always be… country to the core. Porter Wagoner died just four months after his fiftieth anniversary on the Opry. He was admitted to hospital suffering from lung cancer on October 15, 2007 and died on October 28. During the last year of his life, he had seen more success than he'd seen in many years. A new album produced by Marty Stuart for a punk/new wave label, Anti, led to career retrospectives in the 'New York Times,' 'No Depression,'and other magazines, and he opened for the Whites at Madison Square Garden. It was a good last hurrah for one of country music's elder statesmen. Sixty-five years earlier, in 1942, Porter Wagoner had been in the audience when Grand Ole Opry star Roy Acuff came to West Plains, Missouri. Later that day, Porter found Acuff in a diner, and told him that he too wanted to be a country star. Acuff heard this several times a day, and was unfailingly supportive, but probably didn't think for one moment that he would ever share a stage with this shy, lanky kid. Wagoner was born in West Plains on August 12, 1927. His career began in the Ozarks, and he moved quickly to the region's powerhouse station, KWTO. In 1953, KWTO's management started the Ozark Jubilee, even hiring the Opry's former star host, Red Foley. Then, in 1955, the Jubilee became the first country music show on network television, so Porter faced a tough decision when the Opry called. Shortly before the Ozark Jubilee reached network television, Porter Wagoner became an RCA recording artist. The label dropped him, but then did a quick about-face when he showed up with Satisfied Mind. The song became a #1 country hit in 1955, but Porter faced an uphill battle getting his music on the radio during the rock 'n' roll era. Things began to turn around for him when 'The Porter Wagoner Show'made its television debut on September 14, 1961. After several years of near-obscurity, he was back atop the charts. Initially, his show only went to eighteen cities, but it eventually became the second longest-running TV show in country music history (second to 'Hee-Haw'). 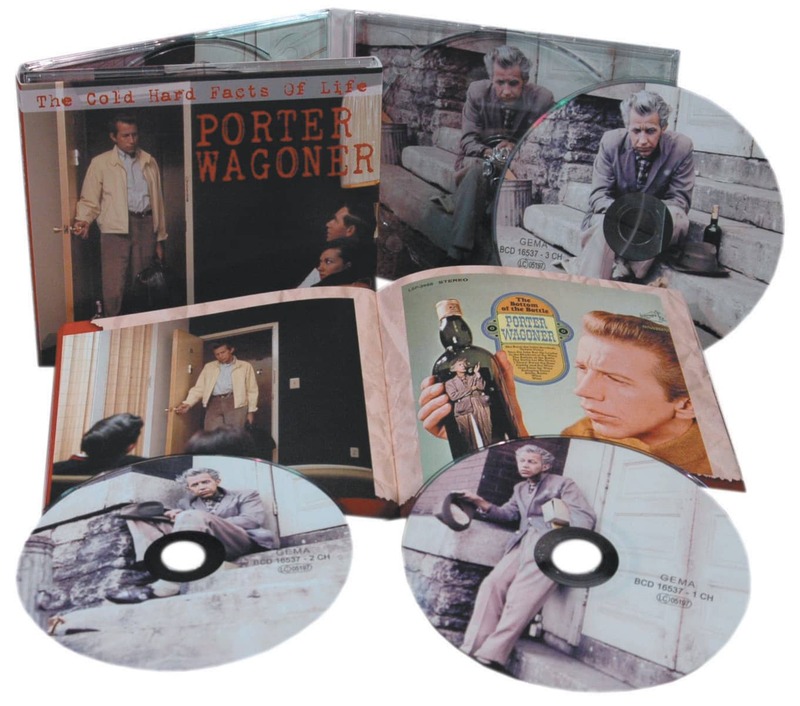 Country music caught up with Porter Wagoner again, and he minted a string of hits in the 1960s, including the original version of Green, Green Grass Of Home. In 1967, he brought Dolly Parton onto his show, and helped launch her career. He began recording 'concept' albums, like 'Confessions Of A Broken Man' 'Cold Hard Facts Of Life, ' and 'The Carroll County Accident' that have become cult favorites in recent years, and he was primarily responsible for bringing soul music star James Brown to the Opry. There was more controversy when he and Dolly split rancorously. Dolly said that their partnership ended because of "creative differences….I was creative, Porter was different." In the end, Porter Wagoner could reflect with pride that he hadn't sold out. He was proudly and unapologetically country from first to last. He went in and out of fashion, but came to epitomise the music he loved. In 1993, Bear Family issued its first Porter Wagoner box, 'The Thin Man From West Plains,' covering his RCA recordings from 1952-1962. When he died on October 28, 2007, Porter Wagoner was still savoring his career resurgence. Once derided as a relic of 'Old Nashville,' the singer unexpectedly discovered an appreciative new audience weaned on his bizarre, slice-of-life concept albums recorded forty years earlier. Critics were hailing his most recent album, as edgy 'alt-country' acts invited him to open their shows at major urban venues. This acclaim was a long time coming. For decades, Wagoner had been an indelible icon of Nashville kitsch, a pompadoured, rhinestone-suited hero among the aging, uncritical motor coach set that made pilgrimages to Opryland, USA and 'The Grand Ole Opry.' Many still associated him with Dolly Parton, who rose to stardom under his tutelage. Respected by his peers and always gracious among his fans, Wagoner generally took a high road, both personally and professionally. He seldom drank and usually avoided bookings in places where alcohol was served. He never staked any claims to songs written by others, an unsavory but common industry practice. Instead of paying his sidemen a union minimum per show, he gave them a share of an evening's proceeds. Professionally, Wagoner was the standard bearer for traditional country music at a time when rock 'n' roll and the Nashville Sound kicked pure honky tonk into the dustbin of history. His television show reached an audience far beyond the American South and Midwest. Musicians as diverse as Marty Stuart and Jerry Garcia cut their country music teeth watching Wagoner's weekly program. The singer's personal life was hardly exemplary. His romantic entanglement with Norma Jean fueled gossip mills. Besides effectively ending his marriage, it ultimately led to Norma Jean's departure from Wagoner's syndicated television show. Seven years later Parton's decision to leave Wagoner to explore broader, more lucrative opportunities led to acrimony and litigation. Like many other entertainers, Wagoner fell prey to amphetamines, although he never plunged to the depths of his more notorious contemporaries. Artistically, no one ranked the singer's unadorned baritone delivery alongside such celebrated postwar country stylists as Hank Williams, Lefty Frizzell, Johnny Horton and George Jones. But appreciation for Wagoner's sincere, straightforward approach has grown steadily in recent years. Marty Stuart, who produced Wagoner's 2007 valedictory album 'Wagonmaster,'hailed him as an "American master and a cornerstone of our music." 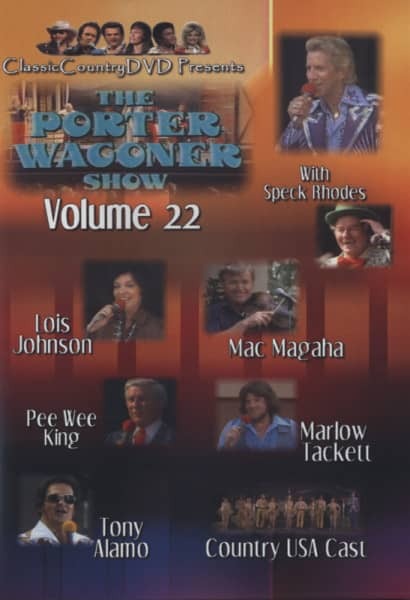 Customer evaluation for "Vol.22, Porter Wagoner Show"